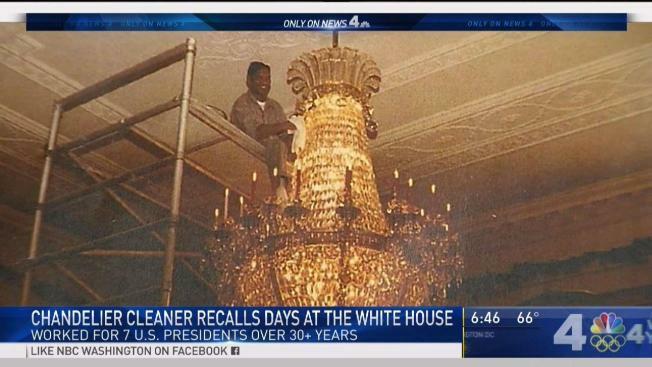 A Maryland man named Stewart Calvin Stevens cleaned the chandeliers in the White House for seven presidents. To President Jimmy Carter, he was just Steve. Stevens got his nickname because he wore a belt buckle that said "Steve." "[Carter] looked at my belt buckle, he said, 'Good morning, Steve.' And, man, that really made me feel up there," Stevens told News4's Mark Segraves. Stevens started working at the White House in 1969, under President Richard Nixon. He had recently finished serving in the Army and initially worked as a window washer. He had a knack for cleaning the tall outdoor windows and wasn't afraid of heights. Then, he noticed the chandeliers needed cleaning. "I see a lot of chandeliers that's got cobwebs hanging all on 'em, and they're so dirty. I said, 'It don't even look like a chandelier,'" Stevens recalled. For the next three decades, he climbed scaffolding to do the painstaking work of cleaning the chandeliers in the White House, some of which have more than 7,000 individual pieces. It could take 18 hours to clean just one. Over the years, Stevens got to know some of the presidents for whom he worked. President Jimmy Carter once invited him and other staff members to join him for dinner. At one point, Carter leaned over and asked Stevens if he wanted his drink. "He said, 'Steve, would you like to have my wine? 'Cause I don't drink wine,'" Stevens recalled. President Bill Clinton consoled Stevens the day his mother died. "He said, 'I heard that you lost your mother,'" Stevens remembered. "And I said, 'Yes, sir, yes, Mr. President,'" Stevens replied. "And he said, 'I've been there, Steve, so just take it easy. Everything will work out. I've been there before,'" Clinton said. Stevens tells these stories and more in his memoir, "The White House Chandeliers." He said one of his favorite memories he recounts is the day he found a check for more than $14.5 million lying in a hallway. Stevens was given a certificate and a $50 bonus for returning the check. "So, I looked at it and I said, 'Dang! You mean 50 dollars and take off 10 dollars for taxes?'" He retired in 2002, when George W. Bush was president. Stevens fell off a ladder and injured himself. Today he lives in Upper Marlboro, Maryland, with mementos of his time in the White House -- and his own chandelier.